Look what I found! A Bananasaver :) It prevents that ugly bruising bananas get from too much bumping about inside bags, especially when they get squished underneath books and drink bottles. 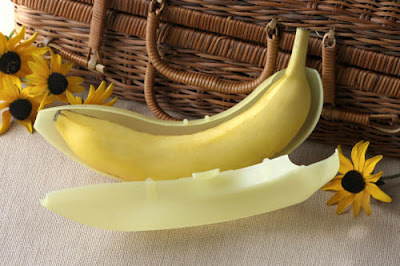 Definitely handy, but it's a bit of a hassle to carry an empty case around after you've eaten the banana inside. You can purchase one at Bananasaver.com, which ships to countries worldwide; but I've also seen these nifty gadgets selling at Howard's Storage World in Australia. - A cluster of bananas is called a hand and consists of 10 to 20 bananas, which are known as fingers. - Bananas ripen best off the plant. They are cut green and stored in moist, shady places to ripen slowly. - In Eastern Africa you can buy banana beer, brewed from bananas. - There is no such thing as a banana tree. Bananas grow on plants. - In 2001, there were more than 300 banana-related accidents in Britain, most involving people slipping on skins. - Bananas have a natural antacid effect in the body, so try eating a banana for soothing relief from heartburn. - Try rubbing the area of an insect bite with the inside of a banana skin. Many people find it amazingly successful at reducing swelling and irritation. - The B6, B12, potassium and magnesium found in bananas can help smokers, trying to quit, recover from the effects of nicotine withdrawal.